Have you ever tried to write a play using a plain word format document writer? If yes, you’ll know exactly how tiring and cumbersome it is. If not, take it from someone with experience. It is not a piece of cake. It’s messy. You end up with a lot of unstructured scenes. Sometimes, you can’t even begin to make sense of what is happening in your play anymore. And it leaves you very disappointed because you put in all that hard work and built everything up in your head for perfection but what you're left with is broken dreams. However, there is a small silver lining behind the experience. Now thanks to our other writer friends, who have been through similar problems and taken matters into their hands to come up with a solution for us to take our script writing to a whole new level of professionalism. 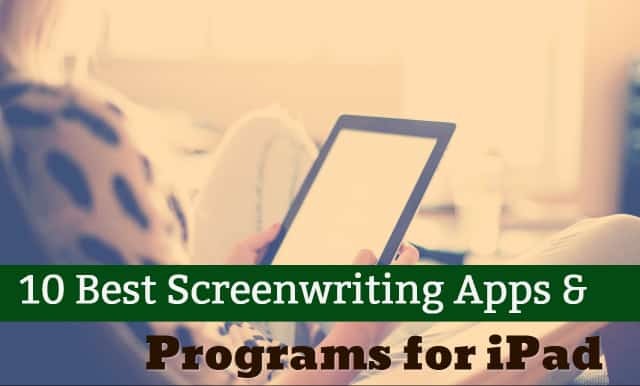 From the creators of the highest selling and most widely used app in the world, here writers are given the power to easily share their personalized and completely adapted files from their laptops to their iPads and iPhones with just a click. So basically, you can work anywhere you want, and anytime you want. Final Draft Writer allows you to edit your current scripts or start new projects with easy navigation. It has access to features like ScriptNotes™ and SmartType™ among others so you can email them and do a ton of other things easily. Want to know the best part? Every time the application is opened, your script is formatted according to industry standards, so half your work is already done. It's a must have for all screenwriters. Do you want a straightforward script writing an app with no extra jazzle? This is the app for you. It's easy to learn. It has a beautiful chic interface. And it uses keystrokes that are familiar to the average Apple user. Double tap the screen to switch between elements. Plus you can import from other writing apps too. So if your friend wants to share their work with you, you know how to do it! The necessary programs are free – which is great. And if you want a wider range of flexibility, you can always upgrade for a few bucks, right? I mean, it’s only fair. It has always been a go-to application for desktop users. And with the launch of its complimenting app, the screenwriting software scene has been taken by storm. Celtx is affordable; it's powerful, it’s handy. It is everything you can ask for when you're writing your screenplay. There are several formats available for your choosing, and you can import and export between your desktop and you iPad with ease. You can even share your updates with the rest of your team, so they get your latest drafts from time to time. The best part? Automatic syncing and online storage of your scripts with round the clock backup. What more can you ask for? If you want a rich text editor for correct formatting and inline comments, footers, headers, stylish sheets you have found your pick, my friends. It is just the app to cater to all your whims and fancies when you get your creative streak going. It allows you to outline your story with index cards, customize your plot, character and setting sheets. The app will even display your index cards out for you while you write, so you don’t lose, the track of your end goal. Edit your fonts, colors, images; go as crazy as you want with making it look attractive. Colour code your index cards for easy reference. And the best part? It organizes everything so perfectly; you will never be muddled with your sections again! It is your all round tool used by writers of all kinds. It has a “Notebooks” feature – which is insanely cool and lets you bundle everything needed for your project together so you can reach for it anytime you want. Organise your notes, and it saves it automatically to the Dropbox, so you don’t have to worry about losing anything ever again. One attractive feature available is that you can activate the passcode to keep your work private. It has a beautiful layout – a sure-fire way to ignite the creativity in you – and includes fonts for every versatile scene you can imagine. Fade In offers you a clean interface for easy manipulation of text and formatting without any extra tidbits, creating a pleasant work experience. You can quickly switch between scenes, characters and dialogues, update on different devices and import to your desktop easily. Use the Dropbox to save your work and forget about losing anything ever again. The basic version is free although it limits you to working on just one screenplay at a time. For added benefits, you can upgrade to the paid version anytime. Fade In is extremely familiar with multi-utility features. You will not be disappointed. One of the first screenwriting apps, this is your go-to app for serious script writing. Use it to write anywhere, anytime and on the go. It has this brown leather interface that makes you feel like you're writing at your desk at home, or in an old Hollywood studio. Today Scripts Pro is easily one of the best available screenwriting apps on the market. It syncs to Dropbox, iCloud and Airprint. Now, what more can you ask for regarding storage? And it comes with all the unique features of index cards and colour formats and highlighting to make things easier for you. Exactly what more do you need me to say to give this one a try? Do you want a personal touch to your scriptwriting? Go for Penultimate which combines handwriting and sketching, taking things to a whole new level to give you an excellent writing experience. It’s like using pen and paper to put your ideas across, only better. Choose from different writing styles and import images to make your work more artistic. The customised stylus is the actual precision-point so that you never go wrong with your job. It makes the digital writing experience a joy – like writing with your favourite pen. Plus, it makes it easy to find any part of your work – just pinch and go! And the best part? You get this all for free. If you want some premium features but the basic version will surely not disappoint you. Your modern workplace to sync all your devices. With Evernote, you can work anywhere, and its gets automatically updated everywhere. Write notes, articles, discuss your ideas – it's all possible with this one handy app. Evernote is uncluttered. It allows you to write without any distractions and without getting messy when you are overflowing with ideas that are flooding across the screen. Attach the files relevant to your current project and keep tabs on them using the check mark feature. Still feel like you need to get more done? No worries. With the premium version, you're all covered to do things that are relevant to your screenwriting experience. You can work offline, enjoy more storage space and add a passcode for privacy to your documents. Get things done with Evernote. You couldn’t ask for a handier tool. Did you want a screenwriting tool custom made for the iPad? Well, here it is. Screenplay provides you with the perfect way for screenwriting on the go. It has a whole plethora of features for you to choose from so that nothing hinders your productivity. Use that Dropbox feature to save your work, import from other file formats and duplicate any scene you like. Create color-coded index cards, change the font, add different backgrounds and change the viewing mode to make things simpler according to your convenience. Manage your scenes, reorder them in a hassle free manner and edit like you have never before with the double tapping feature.